Unlike Calgary’s other satellite cities - Cochrane, Canmore, High River, Okotoks and Strathmore - Airdrie doesn’t have a traditional downtown Main Street lined with historical buildings that once were (and in some cases still are) shops, banks, hotels, pubs, post office, City Hall and Court House lining the sidewalk. Rather, Airdrie’s downtown Main Street is lined with free surface parking next to the sidewalk. The shops (including a grocery store) and services (City Hall, Library and Medical Centre) are all set back from the sidewalk in suburban, strip mall fashion. It is a bit like International Avenue along 17th Ave SE in Calgary. If you drive five minutes south (next to the lovely Nose Creek Pathway) or north along Main Street you arrive at two new power centers with the classic mix of big box retailers (restaurants, hardware and grocery stories) to meet resident’s everyday needs. In 2007, six handcrafted totem poles were donated to the City of Airdrie by Gwacheon, Korea to commemorate the 10th year of sharing a sister city relationship. They are now located in Airdrie's Gwacheon Park. Creative Airdrie is very active fostering art projects like this mural wall. But, if instead you walk a few blocks west from downtown, over the railway tracks and across Nose Creek environmental area, you arrive at what looks like a future Railtown. Several new low-rise condo buildings sit next to the tracks, while across the street is a power centre with a Sobeys grocery store and other amenities including a Good Earth Cafe. It is just waiting for a train station to be built to take commuters to and from Calgary – yes, 25% of Airdrie’s workforce commutes from Calgary. To help meet commuter needs, Airdrie currently has four very successful bus commuter routes. One that links Airdrie workers to CrossIron Mills and McKnight LRT Station, two that are express routes to/from downtown Calgary (one from the east side and one from the west side) and an Airdrie to Crossfield route. The City is also experimenting with a local transit service. QEII highway which links Alberta with Mexico divides Airdrie in half. While all the talk these days in the urban planning world is about making cities and new communities more walkable, cycleable and transit oriented, nobody is talking about how to make urban places more driveable. We have walk scores and bike scores that measure a communities proximity to various amenities 5 or 10 minutes away by foot and pedal, but nothing that measures the amenities that are within a 5 or 10 minute drive. In today’s busy world, of two income families with lots of extracurricular activities (parents and kids), walking and cycling is in reality, mostly a recreational activity, not a form of transportation. Walking and/or cycling, as a part of everyday living is just not practical for the average family, no matter how close they are. The automobile is not going the way of the dinosaur anytime soon, no matter what the urban evangelist say. For Airdrie, it is even more critical that its urban design adapts to the needs of the families with young children - a whopping 24% of the population is under the age of 14 (16% in Calgary). Having recently driven and walked around Airdrie, it seemed to me everybody lives within a 5-minute drive to one or more major grocery stores, probably the most important amenity to a growing family. It also seemed the Rocky View School Division has been able to locate schools as needed in its new residential communities. Kudos to the City of Airdrie and Rocky View School Division for collaborated along East Lake Boulevard on the city’s east side by co-locating the Bert Church High School, Bert Church Theatre and Genesis Recreation Centre (Pool, Gyms, Twin Arenas and Fieldhouse) next to each other so the facilities can be shared. This should be the model for every high school site in every region- also include a public library. In the future, all school sites should be community/ meeting places. Airdrie boasts an ambitious schedule of annual family festivals - a Santa Claus Parade that attracts over 20,000 people (Calgary doesn’t have one), Festival of Lights (older than Calgary’s Zoolights), New Year’s Eve Fireworks, Canada Day Parade and Spring Music Festival (with over 400 musicians). The Airdrie Pro Rodeo is one of the top 10 pro rodeos in Canada with $146,000 in prize money. Today, Airdrie boasts 1,200 acres of parks, 104 km of pathways, 63 playgrounds and 5 off-leash dog parks. For those who want to walk or bike, Airdrie has lovely pathways and parks along Nose Creek and the many canal communities in the city. Everybody is just 5 minutes away from a park, playground or a pathway. The city also a thriving Farmers’ Market in Jensen Park, which was the site of the historic Jensen family farm - that’s authenticity. Every Wednesday from June to Thanksgiving, from 3:30 to 7pm dozens of vendors sell fresh produce, food trucks serve up good grub and artists entertain, creating a fun, family food festival. “Airdrie goes beyond the typical chain-only style of many bedroom communities. Certainly there is no shortage of chain restaurants in Airdrie but there are many high-quality independent places too such as Thai Charm, Abe’s Restaurant, Sushi Haru and Taj that satisfy a very sophisticated market,” says Calgary food and restaurant critic John Gilchrist. Nose Hill Creek creates a pastoral setting in the middle of the city. While most people think of Airdrie as a bedroom community of Calgary, in reality only about 50% of Airdrites work in Calgary. Airdrie has over 20 companies that employ over 100 employees - Propak Systems Ltd. being the largest with 1,000 employees. One of the biggest employment sectors is the grocery industry (I counted 6 major grocery stores with another under construction - I may have missed one or two) currently employ over 2,500 people. As well, Airdrie has 1,300 home businesses (out of 21,000 homes) partly as a result of an innovative program that proactively encourages the development of home-based businesses. It consists of an online course for starting, running and growing a home business, as well as a mentorship program with an existing business leader. Over that past 10 years, Airdrie’s commercial development has been growing as fast as its residential development as the ratio of commercial to residential tax assessment values has maintained its 17% commercial to 83% residential split. Airdrie is more than just a bedroom city. Good Earth Cafe and patio part of a car-oriented big box power centre, is also walkable from several major condo complexes a block away. Modern new condo complexes a few blocks from downtown Airdrie. It’s young: The median age group is 30-34 years of age, 83% of the population is under 65 years old with the majority, 64%, under 45 years old. The median age in Airdrie is 32.4 compared to Calgary (36.4) and Canada as a whole (40.2) years. It’s growing very quickly: Airdrie is one of the fastest growing communities in Canada; population growth for the past sixteen years has exceeded 5.5%. Between the census years of 2006 and 2011, the population of Airdrie increased by 47.1%. The City is projected to grow a further 75% by 2030 to reach a population of 90,000. It’s recent: Over half of Airdrie residents have lived in Airdrie for less than 5 years. According to 2014 survey, of those who have been at their residence for less than 1 year, 38% moved from Calgary and 32% from within Airdrie. It’s mobile: Over 90% of Airdrie residents report that their primary mode of travel to work is single vehicle transportation (for Calgary its 72%. While a large number of residents commute to the City of Calgary for employment, 50% work within Airdrie or places other than Calgary. It is important urban planners adapt their thinking to the needs of the contemporary family life, rather than expecting families to adapt to planner’s urban utopian ideals. Kudos to Airdrie’s planners, politicians and business leaders for daring to be different, for embracing “driveability” as the key element to enhancing the quality of life for everyday living for its citizens. An edited version of this blog appeared in the Fall Edition of Loving Airdrie magazine. It wasn’t that long ago that highrise condo living in Calgary was limited to just a dozen or so buildings. However, since the turn of the century, condo living across the city has not only become much more commonplace, but highrise living has also become very trendy in the Beltline, East Village, Eau Claire, Downtown West and Mission communities. Over the past 10 years, over 30 highrise condos have been built in Calgary, so perhaps it isn’t surprising three enterprising realtors decided to create the Highrise Condo Group (HCG). Julie Dempsey, Steve McKenna and Tim Huxley, all members of Sotheby’s International Realty Canada have not only created HCG, but have developed a comprehensive new website devoted to highrise condos in Calgary (highrisecalgary.com). They are shocked how often experienced buyers are willing to purchase condos in poor buildings or in poor locations in quality buildings. #2 Always buy the best view. It is important that you know as much as you can about not only your condo, but also the building. For example, visit the parking stall to determine how easy you can park in it, where it is located relative to the elevator or how low in the parkade is it. A poor parking spot can be a time waster and negative for resale. Huxley also recommends buyers verify measurements of all rooms don’t rely on marketing condo plans. #4 Visit often before buying. McKenna encourages his clients to visit a condo several times before buying. He suggests you visit in the daytime and night, as well as on weekends to experience how clean the building is and what happens in the neighbourhood. #5 Get to know your neighbours. Dempsey makes sure her clients talk to people who live in the building. She loves to hijack residents in the condo elevator so she can drill them with questions about what it is like living in the building and the immediate neighbourhood. Dempsey encourages her clients to purchase a “statement of occupancy.” For about $20, it will tell you how many of the units are owner-occupied and how many are rented. Typically condos with higher homeowner occupancies increase in value more than those with lots of investment units. #7 Be aware of pending developments. It may be a parking lot today, but in a few years it might be a 20+ condo that blocks your view of downtown or the mountains or an unoccupied building today can be a nightclub tomorrow. On the plus side, a new condo nearby can bring more retail, restaurant or café and maybe even better transit service. It pays to know what the neighbouring landowners might have planned for future developments and what the land uses are. #8 Are you really going to use the amenities? Your condo fees are paying for the amenities even if you don’t use them. An extra $100/month in condo fees for amenities you aren’t using is $1,200 you could be using for other things like paying your mortgage. HCG has noticed today’s highrise purchasers are not only looking for great views but also outdoor space. Even if a condo is only 500 square feet, if it has a good-sized balcony, will be more attractive, retain its value and be easier to sell. Units located at the top of the podium (the two to four storey base of many condos that often have office or town house condos) with a patio are hot, hot, hot. Concierge services are also becoming more the norm. While you might think having a concierge is a luxury you don’t need, it is amazing how convenient it is to have someone receive or pick up packages for you, or let in tradesman. It is especially economical in highrises where you have 200+ units to amortize the costs. In some cases, sister condos like Luna, Stella and Nova share a concierge. Dempsey feels there is a growing starting interest in downtown’s eastern communities - East Beltline (east of 4th St SW), East Village, Inglewood and Bridgeland. Highrise Condo Group’s website is definitely worth checking out and those who are interested can not only sign up for free condo market reports, but their FREE limo tours, which typically take you to five different inner-city projects by various builders. I’m in - sounds like and interesting and informative way to spend a Saturday morning. Note: This blog was commissioned by Condo Living Magazine for their November 2016 edition. Then it hit me; The Forks isn’t an urban village it is a tourist district. Recently I was in Winnipeg for a wedding and had some time to wander their mega urban redevelopment The Forks, which is aptly named as it is located where the Assiniboine and Red Rivers meet in the middle of their City Centre. I couldn’t help but reflect on how the location next to two rivers and just east of downtown was very similar to Calgary’s East Village and yet so different. The Esplanade Riel Bridge connects The Forks to the community of St. Boniface across the Red River. It has a restaurant in the middle that offers spectacular views of downtown, the river and the Human Rights Museum. East Village's pathways along the Bow River in St. Patrick's Island Park with the George King bridge in the background. Both sites were meeting places for First Nations peoples long before the pioneer settlers arrived. Both sites are about the same size - The Forks is 63 acres (doesn’t include Shaw baseball park) and East Village is 49 acres (doesn’t include Fort Calgary Park). Both sites were once industrial sites, with The Forks being an old CN rail yard next to their Union Station, while East Village being more of a light industrial area with a rail line running along its southern edge. Both sites struggled in the middle of the 20th century to find new uses. CN Rail moved their yards to the suburbs in 1966 leaving the site vacant. East Village buildings were torn down in the ‘60s to create ugly overflow surface parking lots for downtown. Both sites lack good connectivity to downtown and neighbouring communities due to rivers and railway tracks. Winnipeg's Union Station and railway sheds separate The Forks from downtown. Today, both sites are managed by a CEO who reports to a government appointed Board of Directors. The Forks CEO, Paul Jordan reports to The Forks North Portage Partnership Board which was established by the Federal, Provincial and Municipal governments. East Village President and CEO, Michael Brown reports to Calgary Municipal Land Corporation Board appointed by City of Calgary. Both sites have a major new museum, Human Rights Museum at the Forks and National Music Centre in East Village. Both of which are only national museums located outside of Ottawa. The Forks also has a Children’s Museum, Children’s Theatre and skatepark, while East Village has a mega new library and the family oriented St. Patrick’s Island Park. And each has popular pedestrian pathways, plazas along the river’s edge and an iconic pedestrian bridge over the river. Both The Forks and East Village have very active programming to attract people to the site. The Forks attracts over 4 million visitors to the site and is the City and Province’s number one tourist attraction. The uniquely shaped Human Rights Museum dominates The Forks. In the foreground is a multi-purpose plaza that can serve as a skatepark, busker/performance space or casual sitting area. The Fork's river landing and pathway along the Assiniboine River just before it flows into the Red River. East Village's Riverwalk with the Langevin bridge, 4th, 5th and LRT flyovers in the background. The Market at The Forks is part food court (main floor), part retail space (second floor). East Village: The Simmons building has an upscale restaurant, cafe and bakery. Winnipeg's Children's Museum is one of several cultural facilities located at The Forks. Computer rendering of the Caglary's new Central Library looking west from East Village. The Forks North Portage Partnership purchased all of the land from CN Rail for $66 million, whereas the City of Calgary owned about 50% of the East Village lands at one point. The Forks has no master plan governing how all of its land will be developed eventually, but rather is governed more organically adapting to new opportunities and needs as they arise. The first thing CMLC did was create a comprehensive master plan with a detailed 3D video to help everyone understand the vision of the new East Village as a 21st century urban village. The Forks is actively working with developers to convert 12 acres of surface parking lots next to the railway tracks and Union Station into Railside. The vision calls for $500 million to be invested by large and small developers to build 20+ buildings no taller than six storeys with retail at street level and offices and condos above and $50 million in public spaces. (Railside will be more like Calgary’s University District than East Village in that the land will be leased not owned, as The Forks partnership wants to retain ownership of the land). New condos and the East Village sales centre. East Village’s development was funded by a Community Revitalization Levy (CRL) that was used to upgrade infrastructure and help build new public amenities like St. Patrick’s Island Park, National Music Museum and new Central Library. The $357 million CRL has resulted in $2.4 billion in private sector development and is expected to generate $725 million in new tax revenues by 2027, which will more than pay back the $357 million levy. The Forks is a unique government led partnership with the return on investment (ROI) being shared by the three parties - City receives new property tax revenue, Province provincial sales tax paid on site and Federal Government getting all GST revenues. Like East Village, two of the most popular reason for visiting The Forks are Canada Day festivities and summer concerts. What is very interesting is the Forks has been very successful in creating winter attractions – skating on the river and the Winter Park are listed as the third and fourth most popular activities in a 2015 Survey and not far behind summer concerts the second most popular activity, festivals being number one. East Village hosts an ambitious year-round program of events. It has also captured the imagination of starchitect Frank Gehry who designed an igloo made of clear blocks of ice in 2012. East Village is an intriguing example of private public collaboration based on an ambitious vision, master plan and implementation with a 20-year return on investment and build out. It reflects Calgary’s corporate culture and the love of the mega projects. After 30 years, The Forks is just now completing the return on investment for the three levels of government and is still decades away from complete build out. It reflects Winnipeg’s government culture and love of grass roots development. Paul Jordan and his Board of Directors are happy with The Forks’ slower redevelopment timeline as it allows for organic growth and the ability to respond to community needs over time rather than being locked into a fixed master plan. Regular Everyday Tourist readers know FFQ stands for "fun, funky and quirky"and FFQing is the art of looking for FFQ things to see and do in a city, town or village. We have been in Montreal for just a week now and already we have a good list of FFQ things for visitors. These images also serve a fun postcards of everyday Montreal and the text tells some interesting Montreal stories. You have to admit this is fun, funky and quirky. Found this black and white carport artwork while wandering along Boulevard St. Laurent aka The Main (because it is Main Street and divides the city into east and west). The Main is full of fun murals in the alleys and on the side of buildings at street corners. It makes this street a fun place to flaneur. You can find this garage at 4866 St. Laurent. Jean Toss: Yes that is a pair of jeans (look at the top of the photo near the pillar) being tossed by staff at Jeans Jeans Jeans from a rack on the other side of the store to the fitting area. It is better than the fish toss at Seattle's Pike Market. Go on Saturday afternoon and you won't be disappointed. See video below. Captured this surreal light show at south-west entrance of the Montreal Convention Centre. The sun shining through the building's coloured glass facade created a wonderful mosaic on the escalator, steps, walls and floor inside the building. It is like walking into a stain glass window. Stumbled upon a fun Barbie Doll exhibition in Montreal's Underground City. There were hundreds of dolls with designer clothes in display cases on the walls, as well as several fun vignettes, like this fashion show which was animated with models on runway and flashing cameras in the audience. See video below. The noise you hear is the fountain in the middle of the exhibition space. If you are in Montreal, you have to go to a Cirque du Soleil show. We caught the OVO show at the Bell Centre - it was a wonderful smash-up of ballet, gymnastics, circus, music and visual arts. Fun entertainment for everyone! Walking home one night discovered this quirky roof top artwork? patio? Ecole de technologie Superieure's (ETS) funky campus is located in Griffintown just west of the downtown core. One of the buildings has a very strange and subtle white on white design best seen from across the street. I took this b&w photo to try and capture it. Planning to revisit and see if I can do a walkabout inside. Click Here For More Info. Chabanel Street was once home to Montreal's bustling garment district. Today there are still many wholesalers who have showrooms there and on Saturdays some of them are open to the public. It is a fun place to wander as you never know what you will find. We got to see some of the Fall 2017 lines before the buyers did and heard stories of the good old days. We also discovered this ghostly fashion show of mannequins in one of the empty spaces. 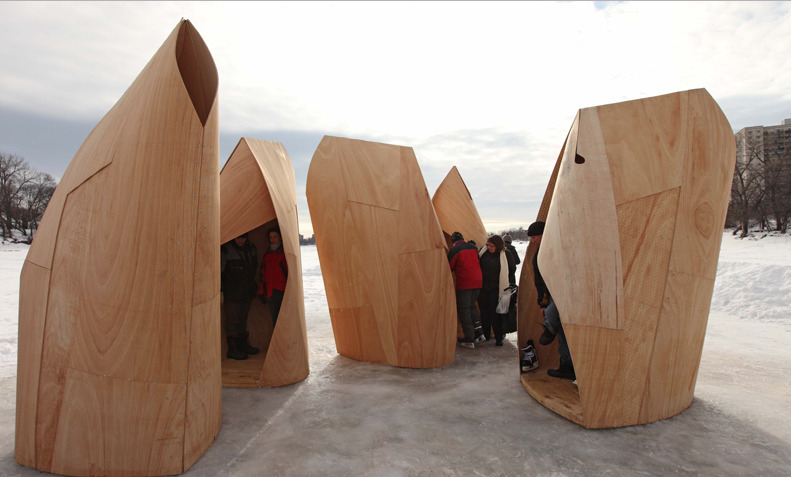 These urban igloos were a quirky surprise. Turns out everyone on this street of row houses has white plastic carports. I am guessing it is winter adaptation due to the fact Montreal gets lots of snow. I sure hope they remove them after winter! This is another of Montreal's amazing public spaces that uses light and colour to create wonderful pedestrian experiences. This is at the Place des Art. A remnant of the Berlin Wall, is on permanent display in the middle of the Ruelle des Fortifications in the lobby of the Montreal World Trade Center building. The lobby is located on the former site of Montreal's walled fortifications which were built in 1717 and demolished between 1804 and 1812. The fragment, donated to the City of Montréal by the City of Berlin to commemorate Montréal’s 350th anniversary, is a testament to Berlin's return to the community of free cities after the fall of the Wall on November 9, 1989. This is not Montreal's "Red Light District." In several places we encountered red lights from buildings shining on the sidewalk creating a fun (and warm) pedestrian experience. I am interested in seeing how it works in the snow. This wall of blue lights changes colours as pedestrians walk by SAT (Societe des Art Technologiques) building. It serves as funky window covering to give some privacy to those working inside the school while also enhancing the pedestrian experience. How cool is that? Found these "pom pom" ladies creating a playful window display along Boulevard St. Laurent. This is the hallway to the elevators at Place Ville Marie to their Observation Deck on the 44/45/46 floors. It is literally like walking into a geometric painting. FFQ for sure! This was lucky find! It was in a restaurant under construction in Little Burgundy. I was stopped in my tracks by two guys carrying in a huge mirror from the street. I couldn't resist looking inside and this is what I found. Wasn't that a party? I am astounded at the number of contemporary art galleries in Montreal. And they are everywhere, not just in the City Centre - Old Montreal, Little Burgundy, St Laurent, Rue St. Hubert, Plateau and Miles End. And this was after only five days? Montreal is very fun, very funky and very quirky! My kind of town! Woke up Monday (Nov 7, 2016) morning came downstairs to find Brenda all excited about a Sherry Festival produced by Richard Harvey at Calgary’s Metrovino the week of November 14th. Immediately, memories of our first trip to Europe rushed into my still sleepy head. We were young and naïve. And I was cocky. We had booked a 3-week road trip adventure in Spain and Portugal. We landed in Lisbon at afternoon rush hour and had to get to Cascais what we thought would be a short, easy drive to our hotel. Wrong. It was like driving the Deerfoot with traffic circles thrown in for some fun. (Note: this was the late 80s and I had never seen a traffic circle in my life.) It was white knuckling all the way. Backstory: We thought we were going to die at least 3 times in the first 2 days of this trip. I learned to drive with one foot on the gas and one on the brake. My motto became that of a running back in football i.e. run (or in this case, driver) for daylight. Back to Cascais. We arrived to find none of the streets had signage names at the corner and their were few street lights – it was pretty much pitch black by then. (Note: There was no GPS, or cell phone apps to guide us, just old school paper maps.) We had to park the car and walk around to try to find where we were i.e. the street names were in ceramic tiles on the buildings, impossible to see from the road. Finally, we found our hotel and room to find two twin beds. That wasn’t going to work for us, (remember we said we were naïve) so back down to the check-in desk to see if we could get a queen bed at least. (Note: We spoke no Portuguese or Spanish). Yes, we made the twin beds work. Seville is so rich with history and rituals, everyone should visit there at least once in their life. We were so fortunate that just by chance we were there at Easter. Perhaps one of the most embarrassing moments of my life happened in Jerez (the sherry capital of the world) while I was filling up our rental car with gas. As we entered the busy gas station lot I noticed that one of the gas pumps wasn’t being used so I quickly pulled up to it and as former gas jockey, I was quick to jump out and started the fill up. People started looking and waving at me and saying something but not understanding a word they said, I just kept filling it up. Then someone came over pointed to a word and turned it off. The light bulb came on – I was filling up the car with diesel fuel and it was not a diesel car. What to do? Luckily, we found someone who could speak some English who took us to a pub nearby where we phoned the rental car company who towed the car away and got us a new car later that day (all they charged us for was a full tank of gas). I spent the day feeling stupid and we wasted what was supposed to be a fun day in Jerez tasting sherry. Backstory: When I was an undergrad at McMaster University (’72 to ’76) I was introduced to sherry by one of my biology professors Dr. Davidson who became my mentor (what one might call a “life coach” these days). He would host an annual Sherry Party in his condo full of modern art and Persian rugs for graduate students each year. As the President of the undergraduate Biology Club, I got invited and loved the smooth sweet taste of sherry. My sweet tooth thought I had died and gone to heaven. I started to volunteer to work in Davidson’s lab in the summers, partly to learn more about biology and the life of a researcher, but also for those 5 o’clock glasses of sherry and lively debates he often hosted in his lab. One of our best memories of our trip to Spain were the Easter processions. At first we thought it was the Ku Klux Klan the similarities in the costumes is scary. I first met Richard Harvey back in the mid 1980s when he was a partner with Janet Webb who opened one of Calgary’s first wine stores in the then brand new Glenmore Landing Shopping Centre (the Aspen Landing Shopping Centre of the ‘80s). I used to hang out there every Friday for happy hour enjoying wine and chatting with Richard, Peggy (Peggy Perry the brains behind Willow Park Wine & Spirits), not the and Janet waiting for Brenda to return home from her job in Coaldale. We will definitely be heading to Metrovino for their Sherry Festival that also included tapas from Ox and Angela, Char-Cut, bar C and the Bar Von Der Fels. One of my fondest memories was enjoying a tapas dinner in Seville watching the sunset from a patio on the Guadalquivir River and wondering what was Christopher Columbus thinking when he said off from here to find the new world. Would going every night and see if we can taste all 27 Sherries that Harvey stocks be too boorish? We did after all, we miss out on a lot of sherry tasting in Jerez. I wonder if Harvey has Harvey’s Shooting Sherry, it was one of my favourites. I think they stopped making it several years ago, maybe he has a bottle in the back. Richard Harvey is a urban flanuer who loves to where a beret. Imagine $5 for sherry tasting, tapas and listening to Harvey’s storytelling. Too good to be true; maybe I am still asleep and this is a dream. In 2015, Greg Morrow was appointed the inaugural Richard Parker Professor in Metropolitan Growth + Change at the University of Calgary (Parker was a planner with the City of Calgary for 30 years, including 15 years as the Head of the Planning Department). The Parker Professorship was established to address current community environment and social issues related to metropolitan growth. This five-year position, co-located in the Haskayne School of Business and the Faculty of Environmental Design, at the University of Calgary, sits at the crossroads of urban design and planning, and real estate development. As a member of Morrow’s Advisory Committee, I can attest to some lively debates about the good, the bad and the ugly of Calgary’s infill and new developments over the past year. Morrow, who grew up in Cloyne, Ontario (population 70) has some interesting views on how Calgary should manage urban growth in the 21st century. Q: How is your thinking different than most urban planners? A: I think I depart from most planners when I say the path to good planning lies more in good negotiation and judgment than in more regulations and rules. We should not be slaves to process, policy and technical details. These are important but not a substitute for good judgment. I also don't believe we can or should pre-plan every square metre of a city. Instead, let's focus on where we want to direct growth (major corridors, LRT stations, big under-utilized areas). I think we're also too prescriptive in our land use bylaw; we need a simpler, more flexible bylaw with more emphasis on being outcome-oriented. Martin Expo Town Center, in Los Angeles a redevelopment of a car dealership into a mixed-use TOD or transit-oriented development (being developed by the family that has owned the dealership for 40 years). Unlike many TOD developments which are predominately housing or office, this is a genuine mixed-use project with 150,000 sf of office, a 35,000 sf grocery store, 18,000 sf of restaurants, 46,000 sf of general retail, generous public plazas, and 516 units of housing, 20% of which are affordable units (below market-rate). This is the kind of development Calgary needs around LRT stations. Q: What cities might Calgary learn from? A: We can and must innovate locally, but Calgary should be willing to look to best practices from other North American cities to see how they can be adapted to our context. We don’t have to reinvent the wheel every time. There are great ideas from a lot of cities so we can pick and choose, while still creating our own unique city. We can turn under-used areas into great places quickly and cheaply, like New York did with its Madison Square. We can move towards more market-based parking solutions, like Seattle. We can apply best practices transitioning from single detached to mid-rise buildings along key roads like Toronto’s mid-rise standards. We can keep parking revenue local to help fund streetscape improvements like Pasadena. Toronto's mid-rise standards is an example of a best practice that Calgary could adopt. Link: The rise of the mid-rise! Q: What do you think about Calgary's strong NIMBY culture? A: We need to better explain the rationale for change - reduce congestion, lower water/energy use, improve health outcomes, create communities rich in amenities close to home and lower infrastructure costs to name a few. NIMBYism is a symptom of the disconnect between City policy and what people personally know and value. Calgary’s culture is changing as people from across the world enrich our city; let’s see the value and opportunities this change presents rather than perceive all change as negative. The fact is, cities are always evolving. Planning can’t stop change but it can help shape change to maximize the good and minimize the bad. But we need a stronger commitment to genuine civic engagement and collaboration as opposed to token open houses held after decisions have already been made. This will build trust and understanding between communities, City administration and the development industry. Link: Why NIMBYs speak louder than YIMBYs? Q: What is your thinking on secondary suites? A: It is way overblown in Calgary. It reflects our anxieties and fears of imaginary threats, mostly about renters. But most of us have been renters at one point in our lives! My dad and his mom lived in a suite with his grandparents in Toronto. We should not prevent caring for elderly parents, cultural traditions of multi-generational living - or helping young people become homeowners with a mortgage helper. We know from cities where suites are allowed that (a) there aren't many created (most homeowners don't want to), (b) they are sprinkled throughout the city (i.e. not concentrated on a single block) and (c) they actually raise, not lower property values. A common sense solution is to conditionally permit them and if owners don't fulfill the conditions, they lose their permit. Q: What would you like to see Calgary developers do differently? A: I would like our new communities to be more fiscally sustainable, complete communities. I don’t think we truly appreciate the long-term fiscal liabilities the infrastructure in these new communities will be once they have reached the end of their life cycle. To create communities that can generate enough revenue to sustain themselves, we need a greater mix of uses, more amenities within walking distance of home and more transit accessibility in new communities. New communities must be designed to be adaptable to change over time. And, we need developers and City administration to be more innovative and open to change. LA doesn't have the amount of vacant land that Calgary does, but one interesting large-scale land development is Playa Vista, developed on the former site of Howard Hughes Airport (the project was bought by Calgary's Brookfield Residential). A master planned community, it has been developing over time since 2002, demonstrating that a long-term commitment and phased build-out can create exceptional long-term value (as opposed to trying to build the entire community as quickly as possible, and claiming there is no market for density). This allows the developer to build at higher densities than a shorter build out would allow (since the market would not be there for higher densities). It's organized into blocks, with an emphasis on a high quality public realm, with one-third of the area set aside as a wetland preserve. It has a range of architecture, from traditional to contemporary and a mix of apartments, single family, retail, and office -- a genuine complete community. It's also an ethnically diverse community. Its amenities has attracted several tech companies to locate there (Microsoft, Facebook, Electronic Arts, Belkin). This is the kind of complete community Calgary's new communities should aspire to. Q: Are you optimistic or pessimistic about Calgary's evolution into a vibrant 21st century city? A: I’m optimistic. The annual Calgary’s Best Neighbourhoods Survey tells us the most desired characteristic Calgarians want is a walkable community with local amenities. Let’s give people what they want, places that accommodate driving, but not mandate it. That doesn’t mean they’ll be like downtown – not at all – just better designed with more local amenities. Good city building is about giving people lifestyle choices. We need a greater diversity of housing choices in Calgary. I see this as the key to creating more vibrant communities. Q: What projects in Calgary do you think are examples of good 21st century urban development? A: There are a lot of thoughtful projects in Calgary underway or on their way – East Village, Currie Barracks, Stadium Shopping Centre; the redevelopment plans for Northland and Deerfoot Malls. I also like how the Beltline is evolving into one of North America’s finest urban villages next to a Central Business District. What these have in common is an emphasis on creating interesting, human-scaled places. East Village's community garden was a popular meeting spot for newcomers to East Village this summer, helping to foster a sense of community. Q: Where do you live in Calgary and why did you choose to live there? A: I live in Parkhill/Stanley Park. We chose to live here because it was on the LRT (we have one car), close to downtown and has a great park (Stanley Park, with its swimming, tennis, playgrounds, skating, tobogganing). We have twin five-year-old girls so we can walk and bike along the fantastic Riverwalk system to the shops, restaurants, and amenities in Mission. We have a 2,000-sf mid-century single detached home that cost about the same as a house in the suburbs, but without sacrificing proximity to amenities. Q: What do you hope to accomplish as the Richard Parker Professor? A: My team (myself, 2 postdoctoral scholars, and a team of research assistants) have 3 goals: (1) to help make the University of Calgary a world leader in research on how metropolitan regions grow and change, (2) to develop new courses that bring planning, architecture and business students together to understand that good placemaking is good business and (3) to help inform and influence the debate and decisions re: Calgary’s growth by illustrating the benefits of growing smarter. In addition to being a professor at the University of Calgary, Morrow is also a volunteer member of Calgary’s Planning Commission where he is already challenging administration, developers and planning consultants to rethink how Calgary builds new communities and reshapes established ones. It will be interesting to see if Morrow can adapt his academic-based vision to the realities of Calgary’s economy, market and policies and provide constructive input into how Calgary evolves.